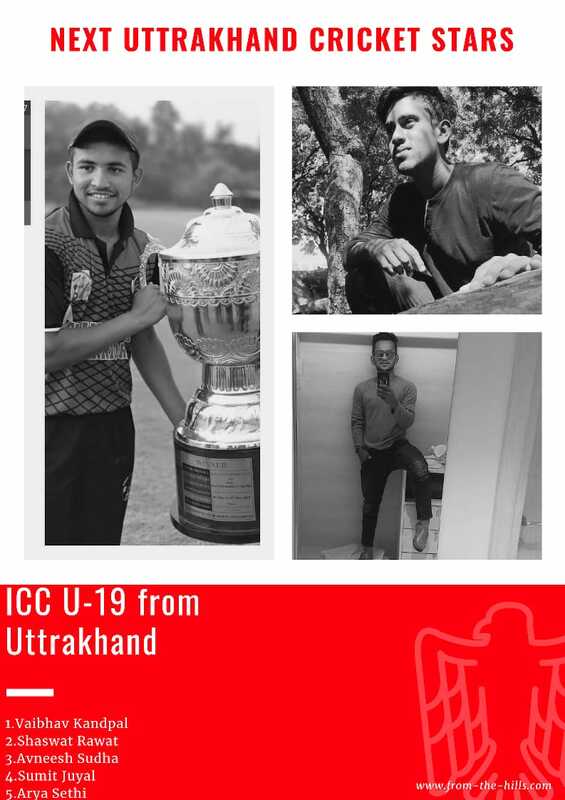 2019 is going to be very lucky for Uttarakhand and Indian cricket team as three players from Uttarakhand have been selected for India under 19 ICC team and two other players from origin of Uttarakhand have been selected from other states team these 5 players will play against South Africa and Afghanistan the team has been announced for the four days series this is going to start on 20 February and 26 February. Vaibhav Kandpal is player from Delhi team he has been selected in under 19 cricket team for the matches against South Africa. Vaibhav Kandpal is basically from Kanda Bageshwar and his family and settled in New Delhi in his earlier records he has made 4 centuries and two half-centuries in eight matches of Cooch Behar Trophy. Shashwat is playing from the team of Baroda. He lives in Shyampur Haridwar family is basically from Almora. Saraswat Rawat has done his learning and training in Maharana Pratap sports college after that he played 4 matches for Baroda in Venoo Mankad Trophy. From the Jaspur of Udhamsingh Nagar Avneesh Sudha has been selected in under -19 team of Indian cricket for four one-day series cricket match against South Africa and Afghanistan. He had played in Ranji Trophy and made stunning 91 runs in the first session. In the Matches of Cooch Behar Trophy, he has made three centuries and three half centuries for this magnificent performance he has been awarded. Sumit Juyal is fast hand bowler in Uttarakhand team he has been selected in under 19 Team B of the Indian cricket team. Sumit Juyal is from Dehradun. He has taken 53 wickets in 9 matches of Cooch Behar trophy and taking of five wickets for six times in eight matches is in his record. Arya Sethi also has been selected under 19 Team B of the Indian cricket team. he has been played in Vijay Hazare Trophy with the senior team and in the final match of Challenger Trophy, Arya Sethi has made fabulous 90 runs. This List shows the capacity of Uttrakhand Boys in the sports category. Sooner the list will grow as state cricket association has been coming in existence. What do you think?